Hello again! After several months of having our hands full caring for our new addition, we finally have enough hands-free time to do a little writing. Despite our silence over the last few months, life continues as usual at Lime End Farm, with a few new schemes to boot. Most notably, Matt has been overhauling our grazing system. 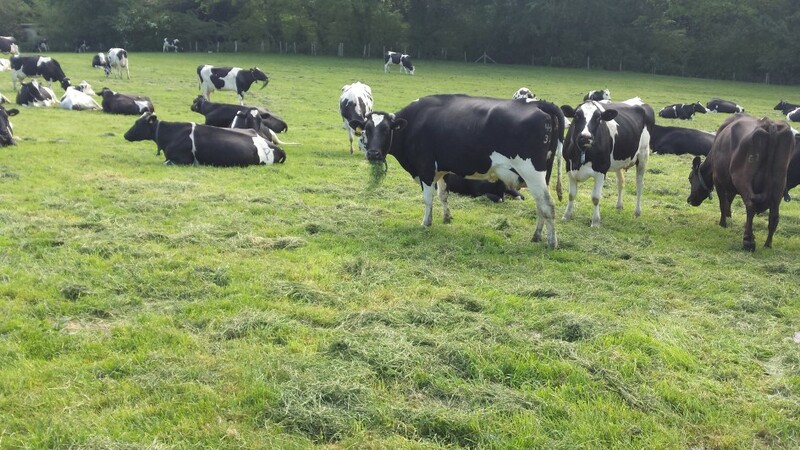 Grass growth is now measured, and grazing areas are allocated to the herd according to their energy requirements. The theory being that this will optimise both yield and quality, and make better use of our cheapest resource. Having hosted a farm walk, with a few grazing enthusiast and veterans, Matt received some tailored advice, which has helped inform his plans going forward. We have taken the bold step of cutting over half the grazing platform for silage, and cutting the cake ration significantly. As always, new approaches bring much debate, among the team as well as within the herd! This undertaking has essentially meant re-teaching ourselves, and the cows (with some protestations), how to graze. But as in all aspects of life, there is always something new to be learned, and some improvement to be made, if we want to keep moving forward. John has been pleased with the progress of the field work. All the maize was drilled, and the first cut of silage completely finished, in time for the Heathfield Agricultural show, which was attended this year by three generations of Mr. Fords. The second cut of silage was also completed two weeks earlier than usual. The current topic for debate among the tractor team is the long term plan for replacing machinery. What started with hypothetical dreaming quickly snowballed into a mass of quotes, as the choice of vehicles, not to mention payment options, seem endless. But whichever way you look at it, this decision involves a lot of money changing hands, and with the milk price still decidedly low, there’s understandable hesitation. As the cows come to the end of their production year, preparations for calving and calf-rearing are underway. We hope to have a few vet students with us over the summer, and will be welcoming this year’s Plumpton student. After having to rear and house all our beef calves last year, while under TB restrictions, our facilities have had a much needed upgrade, and we are hoping that this year will feel quite quiet by comparison. Anyway, Matt and Liz are of the opinion that a couple of hundred heifer calves will seem pretty simple after one David!